What underlies our ability to innovate, our drive to create? What makes us the only species able to remake our world on the enormous scale that we do? 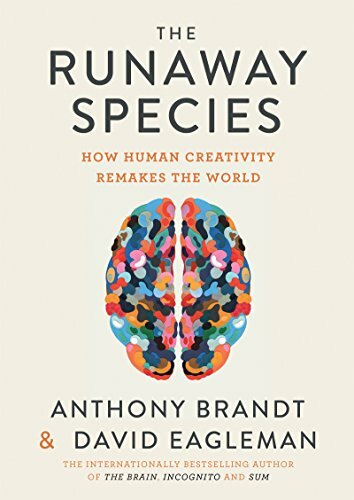 Answering these questions would be daunting enough, but composer Anthony Brandt and neuroscientist David Eagleman go further to explore where creativity comes from and how we might harness it to improve schools, corporations, institutions, and our individual lives. “No other species puts so much effort into exploring imaginary territories,” nor does it seem so determined to turn “the make-believe into the real.” The book fleshes out this idea in three parts. The authors first introduce three principles they call Bending, Breaking, and Blending. Part II explores how the creative mind uses these approaches, and Part III explores cultivating creativity and what may lie ahead for us as a species. The authors venture into a fascinating discussion of extinction and show it to be a necessary, foregone conclusion that results from nature’s profusion. A frog lays hundred thousand eggs; 10 survive to become tadpoles; a few survive to become frogs. Prolific production likewise lies at the heart of creative mentality, one whose mindset also requires a climate that tolerates failure. Google glass wasn’t afraid to drop a product that wasn’t working. Across history “new ideas take root in [such] environments.” Communist societies that stressed conformity have been much less creative than free ones. Innovation is “energized by upsetting routine,” and they quote painter Willem de Kooning as saying, “I have to change to stay the same.” They also show the problem with the trophies–for–everyone mentality common in schools these days: Praising achievement uncritically dampens students’ appetite for risk taking. Better to praise efforts, not results, and to make work meaningful. The authors end with a probing essay on why the sciences need the arts, “a boot camp for bending, breaking, and blending.” More than teaching creativity, the arts steer culture. This is why authoritarian governments quickly clamp down on them. They easily engage in subversive criticism, satire, and parody.